A script for finding active document approval processes. You need to add an exclusive gateway and a script activity at the beginning of a script. Make the "There are active processes" the default transition. Document (context.DocumentHere) – variable of the Document type. The document which is sent for approval. Process List (context.CheckList) – variable of the Text type. P_Approvement - database class name of the process, whose instances are searched. You can find this name on the Settings tab of the business process. DocumentThere - the name of the context variable in the database. Matches with this variable are searched. In this example, you need to find a document. 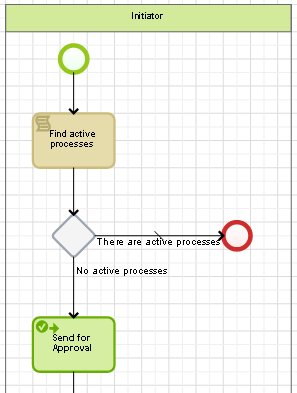 The name is displayed on the Context tab of the business process.